On Tuesday the 3rd of March 2015, a Quality Boost! Meetup was held by Improve Quality Services and InTraffic in Nieuwegein, the Netherlands. The evening was organized around a session by James Bach, who performed a ‘testing autopsy’ — or ‘testopsy’. Huib Schoots facilitated the questions and the discussion and Ruud Cox created a sketch note. James’ aim was to test a product for ten minutes, narrate his train of thought during that session, and afterwards discuss what happened. He chose this approach in order to be able to do a close examination of what happens during testing. The definition of an autopsy, according to Merriam-Webster, is as follows. The definition above describes pretty accurately what James was trying to do with the testing session. By making explicit the thoughts that guided him during the testing of the application, he made them available for examination. He told the audience about narration — the ability to tell a story — and how important it is for a tester to explain what he is doing and why he is doing it. There are many reasons why narration is important; for example because you want to explain to your team mates what you did. But James’ main reason for narration in this session was to be able to teach us about testing and about the particular skills that are involved in testing. James said he does not recommend spelling out a testing session word for word. He showed us an example of a report that he created when he was challenged at the Let’s Test conference to test a volume control for a television. In the report he explains everything that is related to his testing. The report contains mental notes, records of conversations, sketches and models and revisions thereof, graphs, experiments and also pathways that eventually proved to be dead ends. The report contains a huge amount of material, but only part of that material would be useful in a practical report out to, for example, management. The full narration of a testing session has its uses, but you’d have to be pretty obsessed with testing to create such an elaborate report. Therefore James dubbed it obsession-based testing. A very detailed report of testing can serve at least two purposes that were mentioned during the evening. It can be used for teaching testing and to have a discussion about it. The Quality Boost! Meetup that I attended was an example of such usage. It can be used to investigate the skills that are involved in testing. James recently received a detailed test report from Ruud Cox that matched his own obsession-based report. Ruud used the report that he created to find more about the mental models that testers use when testing. The tool that James tested during his session is Raw. Raw is an open web app to create custom vector-based visualizations. 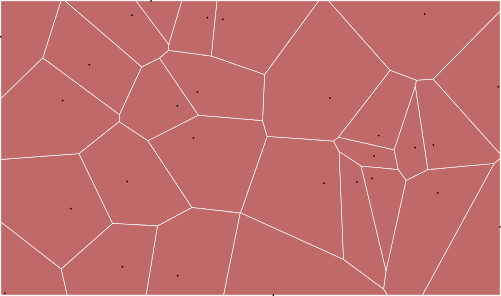 The subject under test was an online tool that can be used to generate — among other things — Voronoi diagrams. The Voronoi diagram is a mathematical diagram in which a plane is partitioned into regions based on distance to points in a specific subset of the plane. Through the tool it was possible to provide a data set as input, based on which the tool would generate the diagram. James had prepared some data sets in Excel in advance and during the ten minute session he ran the data sets through the tool and with the audience he examined the diagrams that were generated. This way we all got to know a little bit more about Voronoi diagrams and about how we could detect if the diagrams that were shown were more or less correct. The type of testing James performed during this particular session is what he himself described as survey testing; a way of learning about the product as fast as possible. He did not focus particularly on, for example, the user interface or on the handling of erroneous data. He just wanted to get to know the application. Later on in the evening, when asked what method he used to explore an application in such a survey, James mentioned the Lévy flight; a random walk that appears to resemble his own type of search. This scanning pattern is made up of long, shallow investigations and short, deep investigations, after which the long, shallow walk is resumed. It seems to be a pattern that is used by animals looking for food (though scientific studies in this direction have been contested), or even by human hunter-gatherers (PDF). Because his aim was to learn about the product by examining it through testing, he called his investigation an act of sense making. To make sense of a software product we need a number of skills. Sense making is something we all have to do in software testing. If the application under test does not make sense to us, it will be very hard to test it. Yet sense making is a difficult art. During the evening we discussed how sense making depends on you being able to handle your emotions about complexity. When faced with a complex problem it is not uncommon to become frustrated or to panic. As testers we have to deal with these emotions in order to progress and get closer to the problem. It may take time to get to the core of the problem and it is possible that we make mistakes. In order to make sense of a situation we have to allow for these phenomena. Other tools that help in making sense are guideword heuristics that aid us in remembering what we know. In order to make sense of an application or a system, we usually need to break down the complexity of this application. In our craft it is not very helpful to be in awe of, or afraid of complexity; we need to have ways to tackle it. James mentioned how systems thinking (and particularly Gerald Weinberg’s An Introduction to General Systems Thinking) helped him to handle complexity. Below are displayed some Voronoi diagrams that were generated during the testing session, using data from the following Excel sheet: voronoi data. As you can see all diagrams except the second display regular patterns that can be checked quite easily for correctness. The titles of the diagrams correspond with the titles of the data in the Excel sheet. to choose input data and configuration parameters that will result in output that is highly patterned or otherwise easy to evaluate by eye. By simplifying the data you throw at the problem, you are better able to predict what the observed result should look like. James calls this a simplified data oracle. He used, for example, his own tool for generating pairs (I believe it was ALLPAIRS, but I am not 100% sure) to generate a simple set of combinations that would serve as input data (figure 3). Also he used his knowledge of mathematics to generate data that would display a spiraling Voronoi pattern. 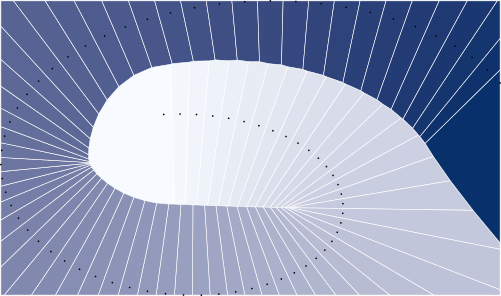 And indeed, a spiraling pattern was displayed (see figure 4). A couple of loosely connected things were said about the flow of testing — or what James called the ‘tempo of testing’ — during the session. The flow of testing is impacted by the aim of testing. Testing is a deliberate art, but there is room for spontaneity to guide your testing. The balance you strike between deliberation and spontaneity (serendipity?) impacts the flow of testing. Also, a session may be interrupted, or you may want to interrupt your session at certain moments. Furthermore we talked about alteration, switching back and forth between different ideas, different parts of the application or between the application and the requirements. 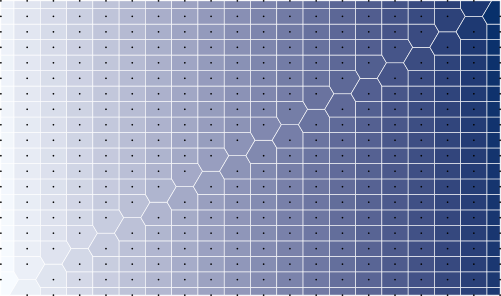 In order to generate the test data for the testing of the application above, James used the following Excel sheet: voronoi data (click to download). He briefly discussed his usage of Excel and mentioned that being skilled with Excel can be a huge advantage for software testers. It is an extremely versatile tool that can be used to generate data, analyze data, gather statistics or draw up reports. I have personally used Excel, for example, to quickly analyze differences between the structures of large database tables in different test environments. Easily learned functions can help you a lot to generate insight into larger data sets. James furthermore related a story about an assignment in which he was asked to evaluate the process that was used by a group of testers to investigate bugs. When he first asked the testers how they investigated bugs he was presented with a pretty generic four step process, such as identify > isolate > reproduce > retest or something similar. But when he investigated further and worked with the testers for some time, he learned that the testers used quite a large number of skills to judge their problems and come up with solutions. The generic process that they described when first questioned about what they did, diverted the attention from the core skills that they possessed but perhaps were unable to identify and name. Narration, as mentioned above, serves to identify and understand the skills that you use. There are many ways to acquire the skills that are needed for testing. One way is to acquire a skill— for example a tool, a technique, or a programming language — by developing it on the job, while you’re doing the work. However, sometimes we need to have the knowledge beforehand and do not want to spend the time on the job for learning a tool or a language. For such situations James recommends creating a problem for yourself so that you can practice the tool or the technique. He showed that he is currently working on learning the programming language R this way. James reminded me of my own work for my website Testing References and having to learn (object-oriented) PHP, CSS, MySQL and the use of Eclipse for software development. This prepared me for learning other programming languages that I can use in projects. Also, I recently bought a Raspberry Pi and I am looking to do something with a NoSQL database (particularly MongoDB) on that machine, just for fun. During the evening James mentioned Apache Hadoop as a possible point of interest. So far for this summary of the Quality Boost! Meetup with James Bach. I want to thank James Bach and Ruud Cox for providing me with additional material. I hope you enjoyed reading it.